The WORCESTER PARK Blog :: Mast It Go There? 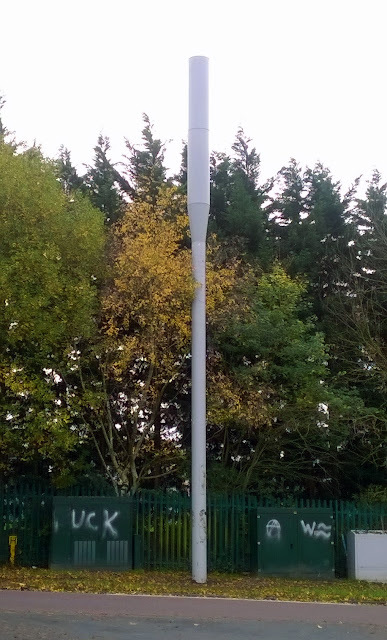 Back in June I reported on the unwanted installation of a mobile phone mast on Salisbury Road just outside the King George V Fields, Auriol Park, opposite Auriol Park Road. "The mast is up and people are distraught. Had a lady weeping on my shoulder yesterday evening so upset. There is graffiti all over the boxes and locals are desperately upset." Unfortunately this is a situation I am all too familiar with. Having fought a similar campaign myself several years ago I was often in touch with groups of people running similar campaigns and they almost always ended this way. I saw evidence that councillors, MPs, council officers and members of the press were routinely sent material that ridiculed the idea that the modulated microwaves generated by such masts (or mobiles in general) could cause any harm. Yet through my research I saw many scientific papers which had found the opposite to be true. Part of their campaign had been based on the fact that the land could not be built on. They have title deeds to prove that the land here is part of the King George V Fields in Trust (meaning that business enterprise cannot be entered into on the land) and belongs to Epsom and Ewell. Apparently Epsom and Ewell had assumed the land belonged to Surrey County Council and then said they weren't sure who owned the land, after which claiming it was adopted (a lengthy process generating lots of paperwork) but could not show any documentation substantiating that claim. A representative of the phone operator has apparently told a meeting of residents that they would not be prepared under any circumstances, to put a mast on a piece of land where they did not know who legally owned it. The mast is there so they must happily know who owns it. It seems there has been a great deal of obfuscation going on here but this doesn't surprise me as I have seen this process used over again in these situations.